This is a wonderful slice of underrated late seventies soul gold. It has a fantastic funky edge too with just a hint of a disco feel on the more uptempo tracks. 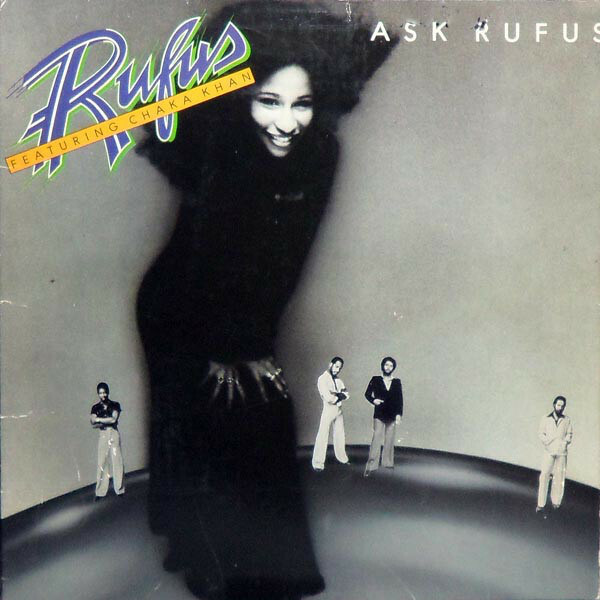 This LP is the perfect blend of Rufus’ songwriting and production and the stunning vocals of a young Chaka Khan.It is this work with Rufus that set her on her way to a solo career. She has never sounded better though than here.The mixture of tempo’s highlight her abilities well and she really lets fire on opener “At Midnight“. For me though it is the strength of the songwriting that makes this LP really stand out. It has also made it sound just as fresh today -40 years after release, a great example is perhaps the LP’s best known cut “Hollywood“. The 70’s obsession with lush string arrangements is here and done tastefully strengthening the depth of the sound rather than drowning it. The band is tight, the production is elegant, the music is introvert. 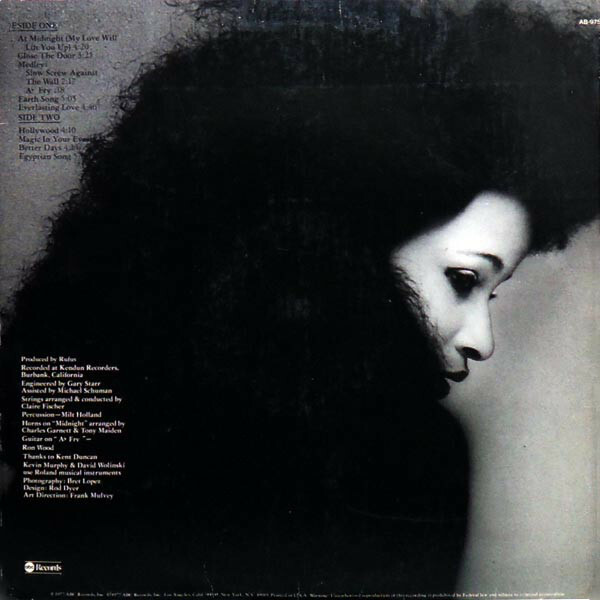 Chaka is at the peak of her art (check the way she sings with herself) and so is Claire Fischer, who wrote some of the greatest scores of his career for this LP, an album that sounds like a late work, it’s a masterpiece. There are a couple of excellent albums by Rufus, but if I had to pick one, it would probably be Ask Rufus. 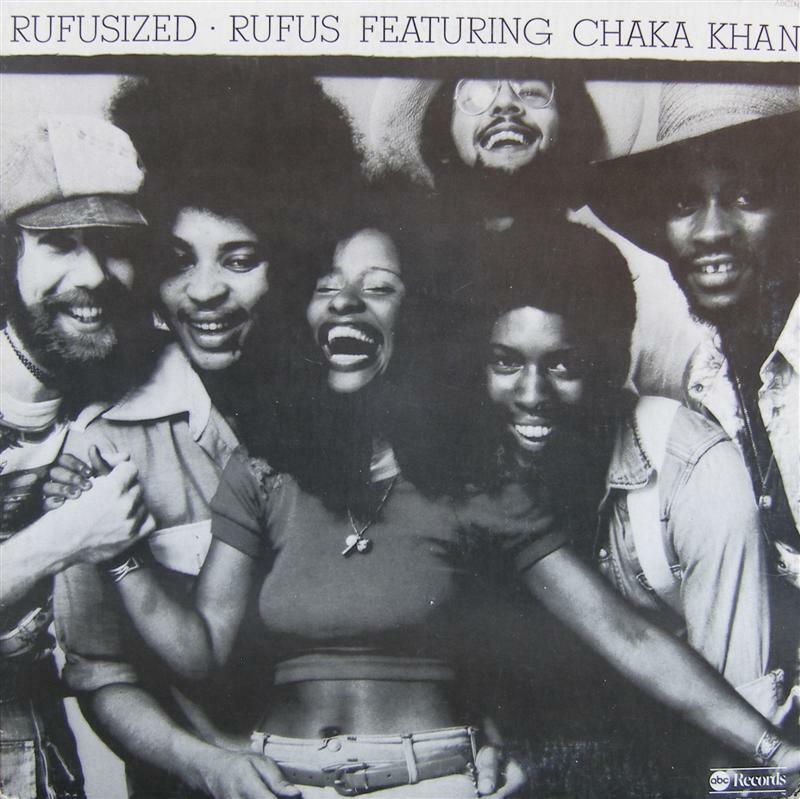 Rufus And Chaka Khan, aside from CK’s amazing and influencial singing have always been just mildly underrated as musicians. 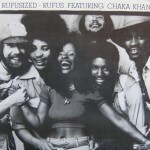 In the years after the debut, especially with the style of the previous Rufus Featuring Chaka Khan their style had been growing from that of a conventional 70’s funk band to what they became with this album. By far this would have to be described as Rufus’s artistic pinnacle and is today justly revered. 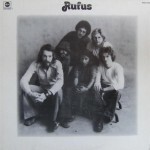 It is here that Rufus made the transformation to being a fully sophisticated band with brilliant songwriting, fully mature and reflective lyrics and plenty of jazz influences. With a couple minor exceptions this album showcases Rufus sticking with a midtempo jazzy soul/funk sound and a great deal of sudlty. 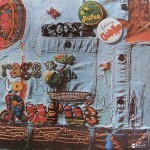 Not only is it solid proof that funk doesn’t have to be a non-stop rhythm barrage to groove like mad but it features songs that all sound like mini classics.”At Midnight” is the main uptempo song here.The production is far from slick and features probably the best use of synthesizer on a mid period Rufus Recording-the simple beat sounds deceptively like disco but on the breakdown it’s perfectly clear that it isn’t. Lyrically it’s clear that Chaka,who participates very strongly as a writer here is content on reflecting on how her own complicated marriaged and personal life at the at time is effecting her feelings on her own womanhood-strong emphasizing emotional involvement. “Close The Door” is one mournful example; Chaka’s tortured voice and the spare backdrop just drips with meloncaughly of the soul. The superb orchestration of Claire Fischer (cousin of the bands drummer Andre Fischer) not only makes that tune so wonderful but dominates the equally mournful instrumental “A Slow Screw Against The Wall“;the briefly funk blowout of “A Flat Fry“,featuring Ron Wood is pretty much the last tune of that type you’ll find here.The memorable and singable “Earth Song” features a cryptic lyric that,if understood sums up Chaka’s lyrical involvement here as she sings,”Stars/what a mystical woman you’ve made me” and on “Everlasting Love” we’re introduced into a deceptively musically simple vision of romance and sensuality. “Hollywood” is…well almost an uptempo song because it’s so sprightly even as it looks at the effect fame and surroundings of luxary effect people. “Magic In Your Eyes” is yet another excellent romantic moment whereas “Better Days“, co-written by Chaka’s then husband Richard Holland reflects on a possible optimisitc future for the then faltering couple. As for the music, let’s just say I think Dido was highly influenced by this song when she did her hit song Thank You ovet two decades later. The title of “Egyptian Song” sounds like the song and lyrics will be very complicated and they are. From the melody down to it’s lyrics it reflects on Chaka’s journey to discover her racial identity that was evidently at that point still very much a part of her life. Here you here a very different kind of Rufus,challanging themselves all around to be a band to contend with a very different kind of groove for a very different kind of funk. 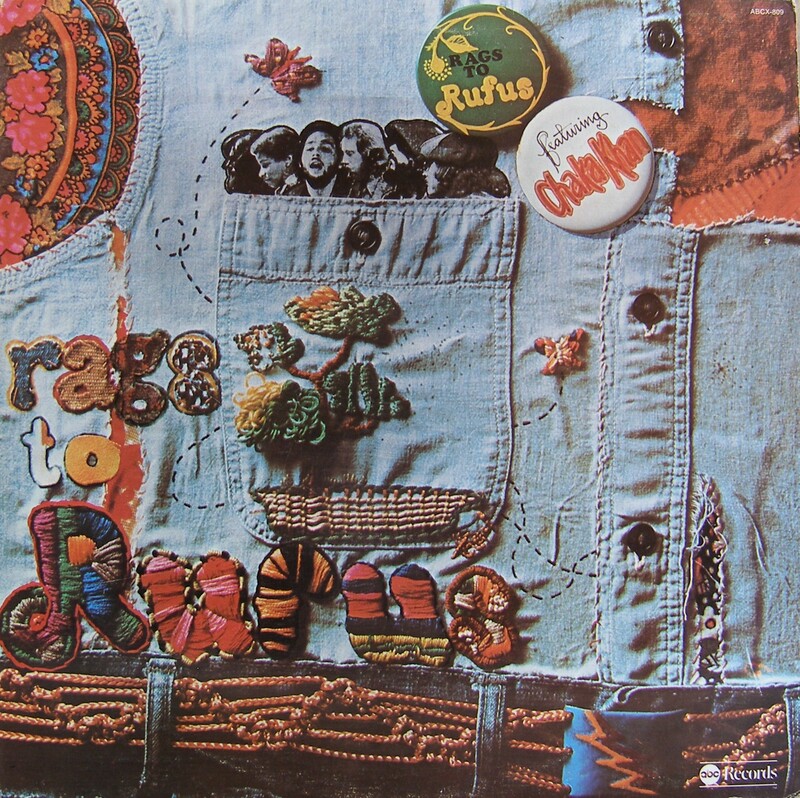 There is little likelyhood you’ll ever come across an album in Rufus catalog or anyone else’s that sounds quite like this.And that really says an awful lot for this. Just listen to the the timeless classic – Everlasting Love. My smooth, slow jam.﻿ Love you Chaka. I have all her old albums and still love them to this day. This is so special to me too. Love Chaka Khan, the one and only…. The only thing you all should say its that this band is great, they are very talented people and the sound of this album its amazing!! oopss …..forgot the magnificent Chaka…She shines ….God bless her. Back in the day, did you ever buy an album because you heard a couple of songs from it played on the radio. You get it home, cue it up on your turntable, listen to the whole LP, only to discover that… “THE WHOLE ALBUM IS A MASTERPIECE”! This (Marvin’s “What’s Goin’ On”, and a few others) is one such album to me! Rhonda that’s so very true. Everyone of us has its own “masterpieces”. Marvin’s “What’s Goin’ On” is such a classic and phenomenal album that belongs to 90% of peoples “masterpieces” and not only those who like Soul/Funk/Jazz. Anyway this is an awesome album, we all should listen to…a must have for lovers or collectors, especially for those who adore 70’s Soul/Funk. Absolutely amazing album. Much appreciated Nikos. Great album, thanks for reminding us all what great music sounds like!